They might seem at odds with each other. An afternoon surfing the Internet can’t compare to time gladly lost in the magic of casting a line. Putting apples and oranges aside, the online world embraces everything on the planet including its very best outdoor sport and Alaska’s favorite pastime. Of course, we’re talking about fly fishing, and we know you’ll really enjoy these 10 sites that make our point. 1. Fish Alaska Magazine – You don’t need a subscription to enjoy this online publication dedicated to everything about fishing in Alaska. Posts are organized by topics that cover it all including ice fishing, recipes and how-to articles. Naturally, fly fishing has its own section filled with the kind of information that’s sure to help fine-tune your delivery talents. Amazing photography makes this site a keeper. 2. 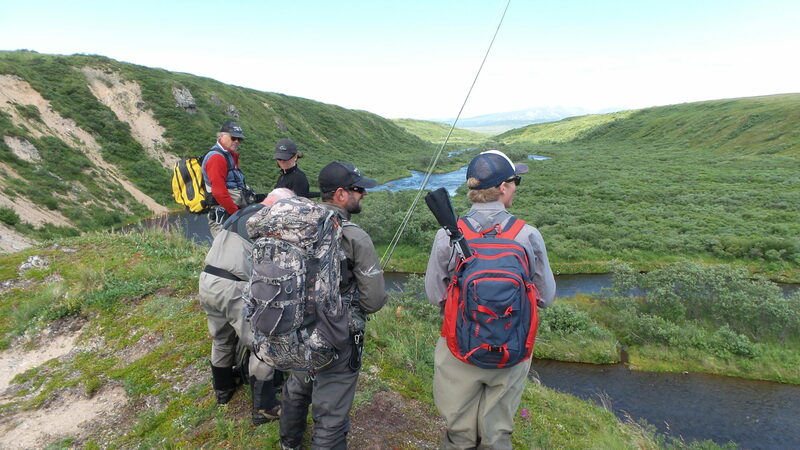 Mystic Waters Fly Fishing – Get it straight from the professional guides’ mouths, and read all about Kvichak River adventures, the latest fly recipes and breaking news on Alaska’s fishing action. Check out tips and tricks, product reviews and the always entertaining Strange and Unusual articles. Site contributors also cover fly fishing in the Lower 48 and Mexico, but we don’t hold that against them. 3. Alaska Fly Fishing Online – We admit, this one looks a little long in the tooth, but it’s got so much to offer that we think it belongs on the list. Compare your techniques with the site’s Stalker series outlining strategies for streams, still water and salt. Cruise the Tips section for posts on tying weedless flies and making tougher peacocks. It’s a shame the Members’ Forum doesn’t work, but overall, the information is timeless. 4. Alaska Dispatch News, Anchorage – If you’ve only heard about the story, read in-depth reporting and recaps devoted to Alaskan fishing. It’s not exactly a blog, but it’s a great roundup of information that really impacts our sport. Some stories are controversial, others are entertaining, and they all serve to increase our awareness of Alaska’s incredible natural resources. Feel free to ignore the Politics section, and just concentrate on fishing news. 5. Alaska.org – Technically, this is a travel connection, but we’ve linked you to its Fishing Tips section to give you an idea of how much the site has to offer. The folks on these pages are wildlife biologists, bush pilots, park rangers and photographers who all love fishing Alaska as much as we do. Of course, if you’re planning a trip, we want you to stay with us here at No See Um, but we know you’ll enjoy all the information rounded up on this site. 6. Trout Fishing Alaska – Yes, this site is trout-centric, and it’s not the snazziest presentation on the Internet, but it’s a rock-solid source for all things trout. Cutthroat, steelhead and bow are all covered along with updated information about licenses and stamps. No, you won’t find anything here about salmon, but the tips and techniques are focused on every type of trout that swims in our Alaskan waters, and that’s what makes this site so unique. 7. Alaska Fly Fishing Goods – We don’t promote specific products, and we’re not starting now, but every fly fisherman should bookmark the How-To page on this site. If you’re new on the river, check out the Alaskan Fish portal for tips on putting together the right gear for a trip. Whether you’re patiently learning to tie your own or need pointers on slicing a perfect filet, the tips and tricks are all smart reads, and the photography is outstanding. 8. The Alaskan Life – Don’t let the title fool you. This isn’t a Martha Stewart take on the 49th State. Sure, it has a Cookbook section, but just like the Journal and Photography pages, everything is all about Alaska. You won’t find many other lifestyle sites with a dedicated Fishing category and articles about targeting trout with beads. Just like you, we love to read about fly fishing, but the posts here are entertaining, Alaska-worthy distractions. 9. Life on the Line – This site should win a prize for best title. Its Alaska Flies and Rivers Blog serves up in-depth information from a professional guide’s point of view, but Ard Stetts can add master blogger to his resume. He covers all the nuances of technique, gear and fish without leaving you feeling like you’re tangled in line. The Photo Gallery by itself is reason enough to visit this site, but you’ll really enjoy Stetts’ presentation of life on the line. 10. The Alaska Department of Fish and Game – It’s official. Fishing reports, anglers’ hotlines and regulation updates are yours with a click. The State does an excellent job of providing up-to-date information. 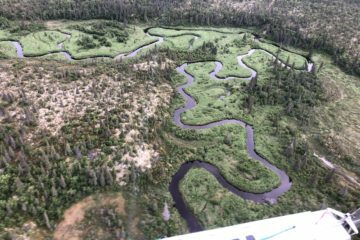 Are you headed for the Kvichak River? Check out daily bag limits and water conditions. There aren’t any bells and whistles here, but you don’t need them. This real-time overview really comes in handy when you’re planning your Alaskan fly fishing trip. We almost put ourselves on this list, but that might sound like bragging. We hope you enjoy our blog posts, so let us know what you think. Share your favorite online reads, and give us feedback on topics you’d like to hear more about. Whether we meet up online or shake hands on the Main Lodge porch, you’re always welcome at our No See Um home where Alaskan fly fishing dreams really do come true.